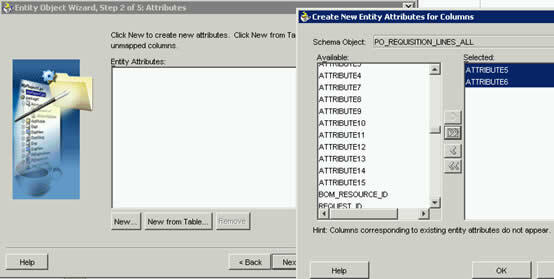 whenever there is a change in Requisition Line Descriptive Flex Fields Attribute5 or Attribute6 or both. It looks quite simple, doesn’t it? Indeed it is quite simple, all you require is the above few lines of code in por_custom_pkg, following which changes to your Line Descriptive Flex 5 & 6 will re-initiate Proc Account Generator workflow. a. Extend the Entity Object that contains these attributes. b. The Extended EO will introduce business attribute properties for these DFF Attributes. This will tell the Oracle iProc engine to regenerate the accounts. d. Bounce the entire middle tier, try your luck by merely bouncing the Apache. OK, here with go into the details of each step. These steps are documented in Oracle iProc Manual too, but in a language that can only be understood by Experienced Oracle guys. Hence this article is an effort from me to explain the steps in naïve manner. FTP and bring all the iProc BC4J classes and XML files onto your PC. Ensure that the location of those packages is included in the CLASSPATH that is defined against your JDeveloper Project. You will need to import server.xml from respective package to open up the BC4J in jDeveloper. Extend the Entity Object PoRequisitionLineEO to create a new entity object named xxxxPoRequisitionLineEO. Now click on Next, until you see the New from Table button as below. Click on that “New from Table” button. 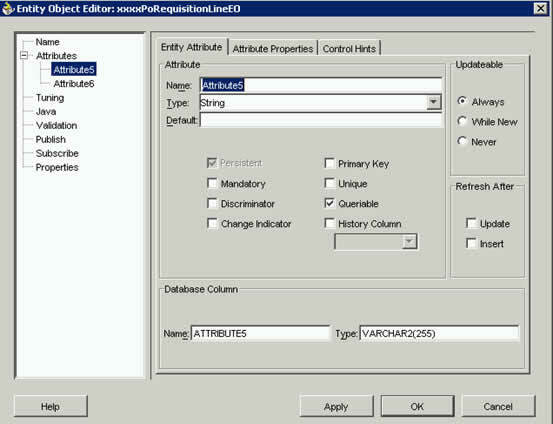 As in the picture below, select Attribute5 and Attribute6 ( or the appropriate attributes in your case). Now, your EO will look somewhat similar to below. Please note that the schema object is PO_REQUISITION_LINES_ALL, simply because in this example, we wish to rebuild the iProcurement Account whenever a change is made to certain attributes in Requisition Line DFF. One of the most important steps is to define these attributes as Business Attributes, to help re-initiate account generator workflow. For doing so, right click on the jpx file within which you had opened iProc’s BC4J packages(this was done by importing server.xml initially). 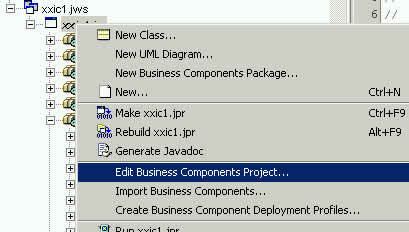 Once you right click jpx file, you will see an option “Edit Business Components Project”. 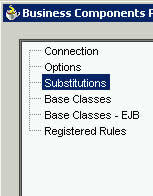 Now, finally you can implement substitution. 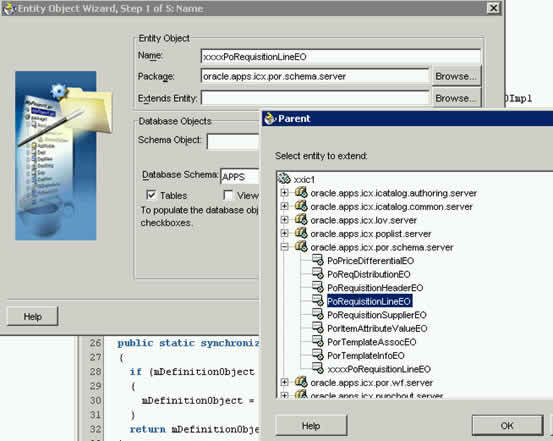 In the left hand pane select PoRequisitionLineEO under the package oracle.apps.icx.por.schema.server. In the right hand side pane, select xxxxPoRequisitionLineEO from your appropriate package. ##Please note that this can very well be done by simply exporting and importing the personalizations too. ##This is so, because the Substitution is stored as a personalization in Oracle. Hang on, not there as yet. You need to deploy the new EO and its implementation on the Unix server under appropriate directory structure. Please note that it is not mandatory to deploy the .java file, but I recommend this to be a good practice. xxxxPoRequisitionLineEO.xml will contain the EO definition and this file is generated by jDeveloper to hold meta info of extended EO. xxxxPoRequisitionLineEOImpl will generate by your favourite jDeveloper too. If you feel confident, the entire Rebuilding functionality can be implemented without touching jDeveloper, but for that you will be directly modifying the files that I have pasted below. In my personal opinion use jDeveloper. // --- Anil Passi iProc Rebuild account. * Retrieves the definition object for this instance class. // Generated method. Do not modify. Recompile the .java file on the server as below. I do this to ensure that everything will work in production without any grief. #Neverthless, this is still safe to Recompile your deployment on Server itself. Your comments are welcome, if you feel I should elaborate any section further. I believe almost every second client on 11.5.10 iProcurement will have to implement this functionality. I did everything mentioned here. But the changes are not gettingpicked up. I am getting an error. About page on the LOV shows that No VO is associated with the page. Neither the old nor the new one. Is there a bug ? None of the steps above pertain to View Objects or LOV. Are you trying to rebuild Charge Account in 11.5.10 in iProc? I have successfully implemented the steps listed above for a client of mine, and it has been live for 10months without any issues. I guess you should email me the precise change that you are trying to implement. EOs are not UI specific objects, they can be shared across multiple UI pages thru VOs. Substitution creates a site level personalization. Having said so, EO substitution will be in effect for all the pages that make use of the EO? And how about VOs and AMs? EO, VO and AM are all substituted at SITE LEVEL. Hence their effect will be felt accross application. One needs to keep this in mind when designing extensions. Controller can be substituted via personalization at responsibility, site, function etc levels. I have a requirement of making customization on iProc. 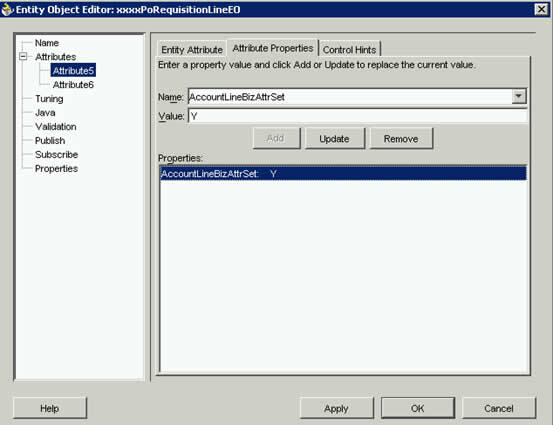 While generating the charge account if the code combination is not enabled than a message should come on the page stating the charge account generated by the workflow. Currently it is giving me a hyperlink 'Enter value'. Probably beside/below to this the expected charge account should come. Important to note that we are currently in 11.5.9 and would be migrating to 11.5.10 in 2mths. I am totaly a novice in iProc. If the charge account is invalid or incomplete then iProc will not return anything into the Accounting KFF. On the contrary, in BackOffice D2K screen, if the charge account is incomplete then KFF gets populated with partial segments. But alas, in iProc it returns absolutely nothing in KFF in case the Account Generation fails. Thanks for all the instructions. They are a great help! I am trying to create a trigger for a header descriptive flexfield. Can you tell me if this is possible? For example we create a dff on headerlevel, this field represents the costcenter for all lines. Now i need to trigger the accountgenerator. My idea is to update an field in the lines or distribution table with the value of the header dff. Default this works for the project field. After the update i can create a trigger as described above. I have some troubles updating the field though. I havent checked this out for a long time, but it appears from your comment that HeaderLevel DFF can't be used as BizAttributes. I request you doublecheck that though, to see if your requirements can be met by extending PoRequisitionHeaderEOImpl. Otherwise you can simply move to using Line level DFF itself. In my case I used line level DFF, and it can still be presented to the user such that they enter values just once into those fields. I have a requirement to change the Purchase Requisition Approval notification for PO Requisition Approval(REQAPPRV). Requirement is very simple. My company wants to see the whole charge Account String instead of cost center. Notification name is PO_REQ_APPROVE. This article is really good one. I started doing same steps on my machine.I am facing issue when I tried to import server.xml file. I copied all files from /oracle/apps/icx/por to my machine. I tried to open server.xml from schema folder. It has open only all .xml files related to views. I can see there are lots of .class file. But I don't see them in my projects but they are very much there in folder. I tried to open some other server.xml file. I got an error "Unable to load objects". I zip and download all BC$J component in binary mode. Did I do any mistake? Do I need to set something here? I have copied all files in myclasses folder also. But It did not work. Also, all the dependent objects must be brought FTPed too.